Lightning Metalite K227 Cloth Rolls are the choice for quality metal finishing hand and jitterbug applications. Coated abrasive rolls are designed for fast and easy sanding of various surfaces, and can be torn to exact lengths as needed. 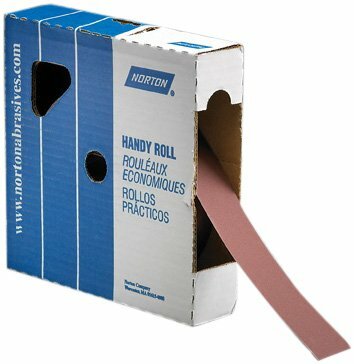 Handy rolls are packaged in a protective, convenient dispenser which eliminates costly waste and permits neat, easy storage. Cloth rolls are typically used for polishing lathe turnings, rolls and cylinders, light deburring, blending machine tool marks, removing rust and scale, and fine sanding and polishing. Rolls are used for hand or jitterbug sanding. View More In Sanding Rolls.